There are plenty of good reasons to drink red clover tea; to help purify the liver, clear up skin problems, and calm menopause and menstruation related problems. Red clover in a good tonic for women of any age. The taste isn't really much, sort of mild and grassy, but it blends well with other herbs in tea blends, add citrusy or minty herbs to improve flavor. 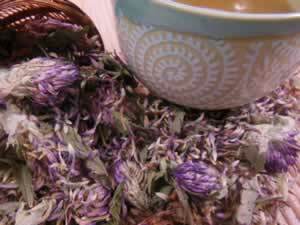 Recipe Instructions: Herbal Tea :Use the standard brew of 1 teaspoon of dried flowers and leaves to each cup of water. Infuse for 5 to 10 minutes. Drink hot or cold.